Are You In Need Of A Night Guard? Discover the benefits of investing in a night guard. Does your jaw hurt when you wake up in the morning? If you experience jaw problems after you wake up, it is likely that you grind and clench your teeth in your sleep, which is known as bruxism. One of the most effective treatments for bruxism is wearing a night guard while you sleep at night. If you are looking to invest in a night guard, you should inform yourself on a few of the benefits. One of the major benefits of wearing a night guard is that it will prevent you from severely damaging your teeth. Clenching and grinding your teeth at night can lead to chipped or broken teeth, damaged fillings, and worn enamel. Excessive damage to your mouth can result in costly restoration and treatments. The last thing you want is to go to the dentist to have them use a drill to correct your filling. A night guard will prevent your top teeth from being in direct contact with your bottom teeth. When it comes to using a night guard, you will see improvements in your sleeping patterns. Clenching and grinding your teeth can cause pain that can lead you to have trouble sleeping. Wearing a night guard helps relax the jaw which can cause you to have a stress-free night sleep. If there is less stress on your jaw, then you have a chance to sleep better throughout the night. If you grind your teeth at night, you are likely to experience headaches, toothaches, and tooth sensitivity. If you tend to clench or lock your jaw while you sleep, then you will likely have a tender or sore jaw, neck pain, and muscle fatigue. 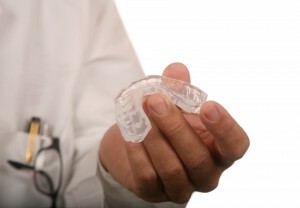 Wearing a night guard will soothe and treat all of the symptoms associated with bruxism. This entry was posted on Friday, July 27th, 2018	at 9:18 pm	and is filed under Blog	. You can follow any responses to this entry through the RSS 2.0	feed. Both comments and pings are currently closed.